Maida Vale is a tree lined park-like setting that has so much to offer residents. Both mansion blocks and stucco covered terraces dominate this village. Maida Vale is north of Paddington in London’s West side and sits between the exclusive St. John’s Wood and Kilburn. The area caters to the more affluent and due to the BBC Studio’s Maida Vale rentals are dominated by those in the creative industries of movies, music, and films. You’ll find many a BBC executive that make their home in this beautiful village. Naturally, made famous by the album cover “Abbey Road” this area offers streets lined with greenery, a canal in the back drop, and hidden community gardens. A bit pricier than Notting Hill, the Maida Vale rental market is strong enough to offer residents a quiet and tranquil neighborhood without the higher end pricing of nearby Marylebone and Paddington. Maida Vale rentals are sometimes few and far between as this desirable pocket of London I a place that once residents find the community, few want to leave. The area is a favorite of working City professionals and attracts those looking to immerse themselves in an upper-class neighborhood that has a strong identity and a great sense of private community. The south end of the town maybe the most famous as its dubbed “Little Venice” to mimic the Italian areas canals and houseboat living. 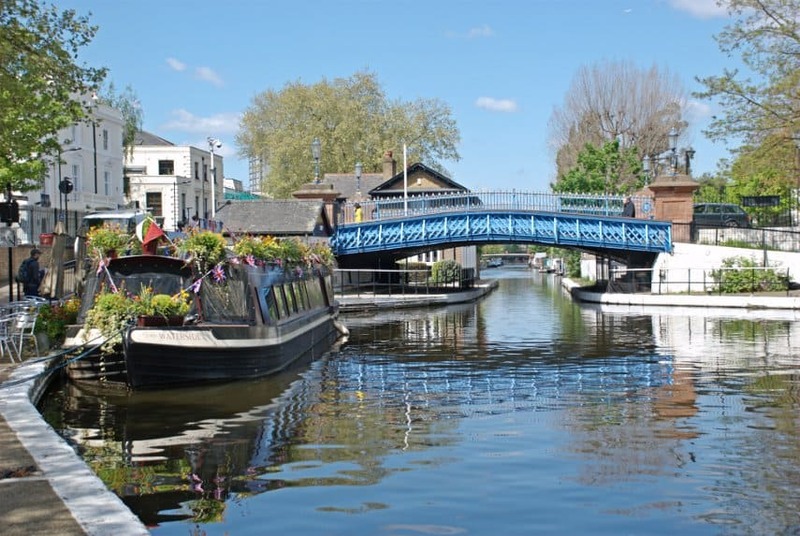 Little Venice begins at the meeting of Regents Canal and Grand Union Canal and boasts some of the more desired streets to reside in Maida Ave, Elgin Ave, Blomfield Road, and Claredon Gardens. This is where one will find all the stucco homes, mansion flats, and period conversions. The Maida Vale rentals markets also offer a good number of selections of the new red brick buildings, spacious apartments with the addition of quaint mews housing and many cobblestone streets, this . Want to know more about Maida Vale Rentals? Maida Vale’s different highlight destination streets offer any fare you care to imagine as the area is known to be a “foodie” haven. For date night sushi consider the minimalist and sleek Japanese Maguro Restaurant, or Gogi Bar and Grill for Korean selections. Another good night out for fine food with friends could have you at the canal side Waterway, for a pub-like experience. Yasmeen Café offers Lebanese and Middle Eastern plates, as does Kish Persian Restaurant. Italian tastes will find Restaurant Fratelli worth the trip, but for takeaway Italian, Da” Daniela is a favorite. L’Aventure and Les Petits Gourmets French fare will satisfy even the more discriminating palates that make their way to Little Venice. But before you leave the area find the traditional British dining in the five-story pub of The Truscott Arms on the corner of Shirland Road and Braland Street. For many, parts of the attraction to this upscale living area of Maida Vale are the shops and their kaleidoscope of offerings. Never will you wander far without the respite of a café or coffee shop. But perhaps one of the lifestyle selections residents make is their relationship with food. There are weekend markets to take in and enough little groceries and shops where you can find the ingredients to match any recipe. For instance, the Sheepdrove Organic Farm Family Butcher who offers only human and anti-biotic free meats and fish for many decades. Warwick Ave offers a number of shops and finds and it leads you down one of the best looking wooded streets in Maida Vale. The closest park to the Maida Vale community is Regents Park to the west which is the location of the ZSL London Zoo. But also close to the area are Rembrandt Gardens and Paddington Recreation Grounds. The Paddington Grounds are some of the oldest green spaces in London, and the largest of Westminster. The park offers much for the sports fan and boasts terrific tracks for running and 13 tennis courts. Paddington Recreational Grounds offer a bowling green that is nearly 100 meters, and two artificial grass pitches and artificial cricket wicket. There is also a café in the park for those who want to stop for a bite. Rembrandt Gardens is just another highlight of Little Venice. The park overlooks the Regent’s Canal and is home to thousands of blooming tulips and fragrant hyacinths. It offers a breathtaking path walk past some meticulously manicured greenery. The Bakerloo Tube line is accessible from two underground stations; Warwick Avenue and Maida Vale. Just a few minutes to Paddington, you are able to catch up with the Circle, the City, the District, and the Hammersmith lines, leaving very little out of reach. The rails are equally represented with Paddington Station offering daily tickets to the Midlands, Oxford, South Wales, and even Heathrow on an express that takes just over an hour.